Dnipropetrovsk Regional State Administration officials are involved in the activities of criminal gangs operating in Donetsk and Dnipropetrovsk regions, Head of the Security Service of Ukraine (SBU) Valentyn Nalyvaichenko has said. "A criminal gang that operated in Donetsk and Dnipropetrovsk regions, gangsters who used weapons against law enforcement officers, and gangsters who kidnapped people, are a single organized criminal group, a single gang. They turn to and sometimes even get help [from regional officials], and we have reasons to suspect officials of Dnipropetrovsk Regional State Administration of financing them," he said at a briefing in Kyiv on Monday. According to Nalyvaichenko, Dnipropetrovsk Regional Administration officials are hampering the investigation into the gang. "Officials, especially in Dnipropetrovsk Regional State Administration, are currently threatening our investigators…," said Nalyvaichenko, adding that officials had threatened the investigators with physical force on the part of illegal armed groups, in particular Sich, an organization that poses as a security firm. "We are threatened with these armed men being sent to us to stop the investigation and to prevent the arrest of the killers," Nalyvaichenko said. Nalyvaichenko said that the prosecutor general has merged criminal investigations into the murder of an SBU officer, the abduction of Ukrainian citizens, and the seizure of dangerous weapons and explosives into one case. 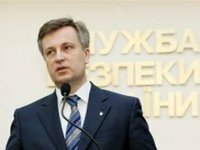 "The organized crime groups are well funded, coordinated, have contacts in politics, including influential lawmakers, so we have grounds to suspect some officials of regional state administrations of committing abductions, torture, smuggling of highly liquid goods, especially alcohol and cigarettes," Nalyvaichenko said.